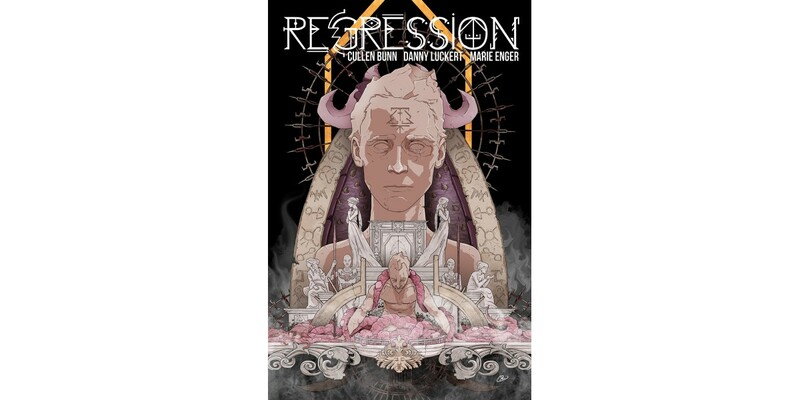 Celebrated horror writer Cullen Bunn (Harrow County, The Damned), artist Danny Luckert (Haunted), and colorist Marie Enger (Pistolwhip, 2 Sisters) will release REGRESSION, VOL. 1: WAY DOWN DEEP this November from Image Comics. This trade paperback will collect issues #1-5 of the mind-bending horror series. Plagued by ghastly waking nightmares, Adrian reluctantly agrees to past-life regression hypnotherapy. As his consciousness is cast back through time, Adrian witnesses a scene of horrific debauchery and diabolism. Waking, he is more unsettled than before, and with good reason—something has followed him back. Adrian descends into a world of occult conspiracy, mystery, reincarnation, and insanity from which there is no escape. “My father was a professional hypnotist,” said Bunn. “While his on-stage performances centered around humor, he conducted past life regressions for select groups. I witnessed several of these regressions, and each one was surreal and eerie in its own way. Subjects described different times and places in vivid detail. They spoke with unusual accents. They spoke languages they had never (to our knowledge) studied. The most bizarre occurrences were the regressions which resulted in a completely silent subject. REGRESSION, VOL. 1: WAY DOWN DEEP (Diamond code: SEP170659, ISBN: 978-1-5343-0337-9) hits comic book stores Wednesday, November 15th. The final order cutoff deadline for comics retailers is Monday, October 9th. It will be available in bookstores on Tuesday, November 21st and can be preordered via Amazon, Barnes & Noble, Indiebound, and Indigo.